A winter storm warning is also in effect for the Coquihalla Highway and the Fraser Canyon, with up to 15 centimetres of snow and similarly strong winds. A windstorm descended on B.C. 's South Coast Friday bringing mass power outages and warnings from meteorologists. Environment Canada predicted strong winds across the province with the strongest gusts hitting exposed, coastal areas of Vancouver Island. Many wind warnings ended late Friday. It forecasted that Metro Vancouver — from West Vancouver to Langley — as well as Howe Sound, the Sunshine Coast and the Fraser Valley could see winds between 70 and 90 km/h by Friday evening. The weather agency said Haida Gwaii may see winds of up to 120 km/h develop Saturday morning. Winds that strong can damage buildings and windows, particularly roof shingles. Loose objects "may be tossed by the wind," the agency warned. Public weather alerts in B.C. Environment Canada said another strong Pacific storm could hit areas of B.C. Saturday evening, including Metro Vancouver, Greater Victoria, western Vancouver Island and the southern Gulf Islands. BC Ferries had cancelled several major sailing routes between the mainland and Vancouver Island due to high winds. Highway 14 on Vancouver Island was closed in both directions for several hours between Port Renfrew and Sooke due to a fallen tree on the road. 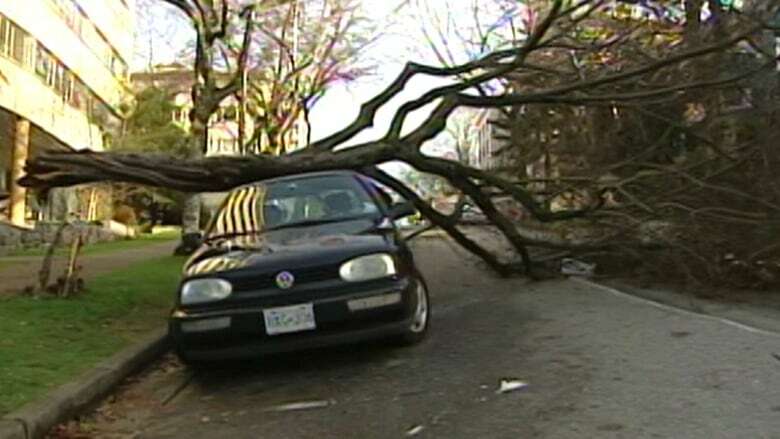 The weather warnings come nearly 12 years to the day after an intense windstorm ravaged the South Coast, particularly Vancouver's Stanley Park. Rain and winds up to 158 km/h ripped out thousands of trees, which smashed into cars and homes on Dec. 15, 2006. More than 250,000 homes lost power. 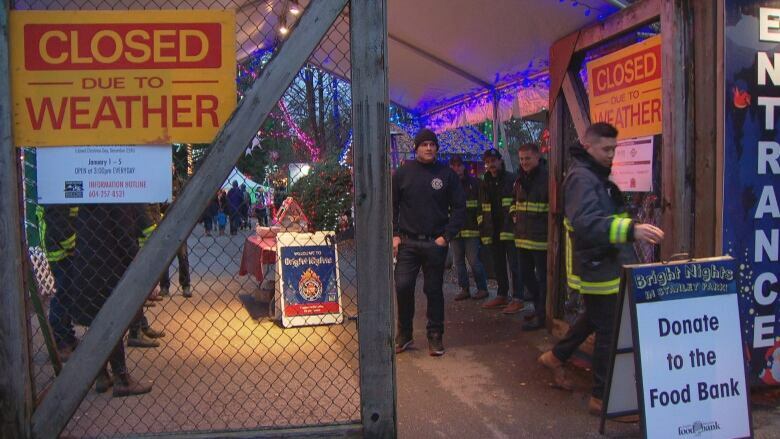 On Friday, the Vancouver Park Board closed Stanley Park's popular Bright Nights Christmas Train early. The board offered refunds for purchased tickets and offered ticket holders the opportunity to use them for admission to the Bloedel Conservatory instead. 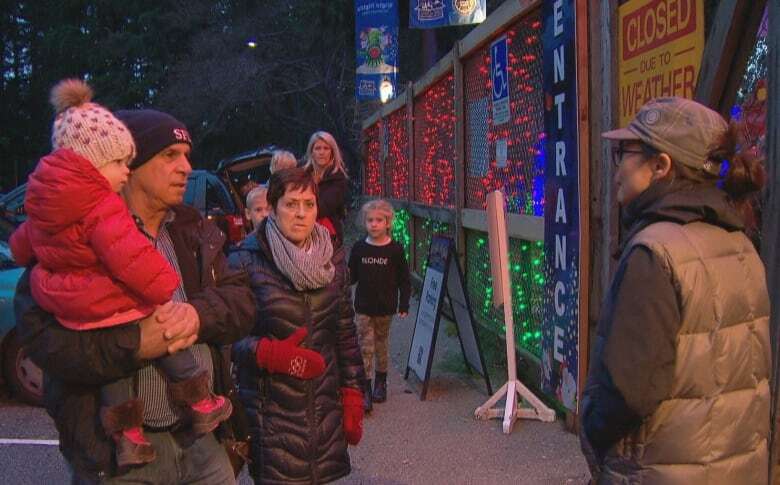 The city's director of parks, Howard Normann, said the seawall would also be closed from Third Beach to the Lions Gate Bridge as a precaution. He added that parks staff, arborists and park rangers will be monitoring the situation at the park Friday night, especially for downed trees. The situation further into the Interior looks no better, if not worse — to the point where non-essential travel along mountain highways was discouraged entirely. Winter storm warnings are in effect for the Coquihalla Highway and the Fraser Canyon. Fifteen centimetres of snow and winds of up to 90 km/h are in the forecast, beginning Friday evening. "Visibility will be suddenly reduced to near zero at times in heavy snow and blowing snow. Poor weather conditions may contribute to transportation delays," said the warning from Environment Canada. "Consider postponing non-essential travel until conditions improve." 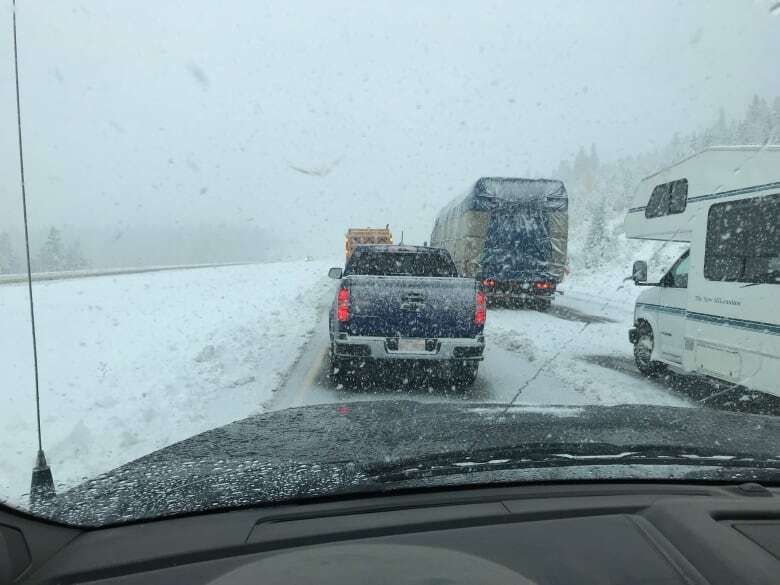 The Okanagan Connector, Highway 97C, could also see similar gusts. The agency said wind will ease overnight with snow tapering to flurries by Saturday. More than 13,000 BC Hydro customers across the province were experiencing power outages as of 11 p.m. PT Friday, largely due to the wind. Customers in Surrey, Chilliwack and the Sunshine Coast were the most affected. As of 6 a.m. PT Saturday, the number of customers still without power had fallen to less than 4400, with nearly two-thirds of those affected residing in Surrey.